Kale, being the most nutrient dense food on the planet, is the go-to base for any salad this season. 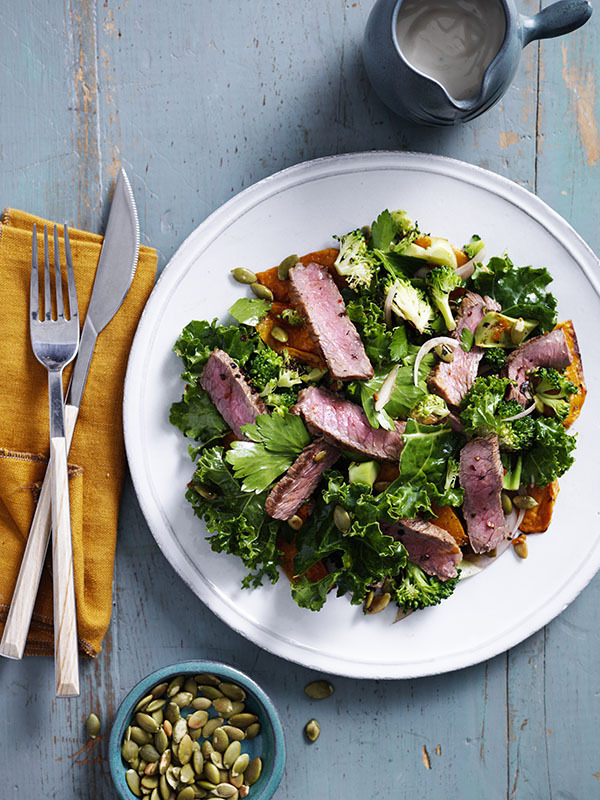 So if you’re looking to serve up something fresh and wholesome, give this spiced beef, pumpkin and kale salad a whirl! Not only is it super simple to make, it contains lots of protein and nutrients to keep you feeling nourished and full. Preheat oven to 200°C. Drizzle pumpkin with 1 tbsp olive oil, season to taste with salt and freshly ground pepper and roast on a baking paper-lined oven tray, turning occasionally for about 25 minutes until browned on the edges and tender. Preheat a char-grill to high. Combine about 1 tbsp olive oil with pepper, chilli flakes and a pinch of salt, brush over steaks and set aside at room temperature while you cook the broccoli. Drizzle broccoli slices with 1 tbsp olive oil and char-grill, turning occasionally for about 8 minutes until just tender and charred a bit on the edges, then when cool enough to handle, coarsely chop and set aside. Wipe char-grill clean then cook steaks, turning once, until browned and cooked to your liking (5-6 minutes for medium-rare, 7-8 minutes for medium), transfer to a plate, cover loosely with foil and set aside to rest for 5 minutes, then thickly slice. Mix the yoghurt-tahini sauce ingredients in a bowl to combine and season to taste with salt and pepper. While the meat rests, combine the kale, shallot, extra-virgin olive oil, lemon juice and garlic in a large bowl, season to taste with salt and pepper and mix well with your hands until the kale starts to soften (2-3 minutes). 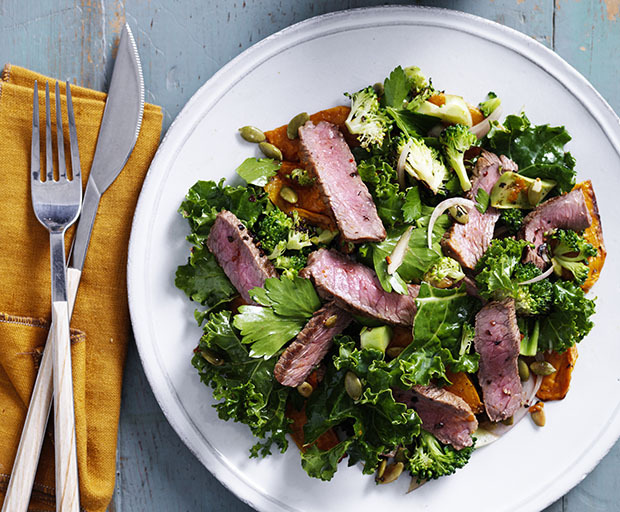 Toss through the beef, chopped broccoli, parsley, barley and pepitas. Spread a little tahini dressing on serving plates, pile the salad on top and serve. Looking for a healthy dinner the family is going to enjoy on a short time frame? 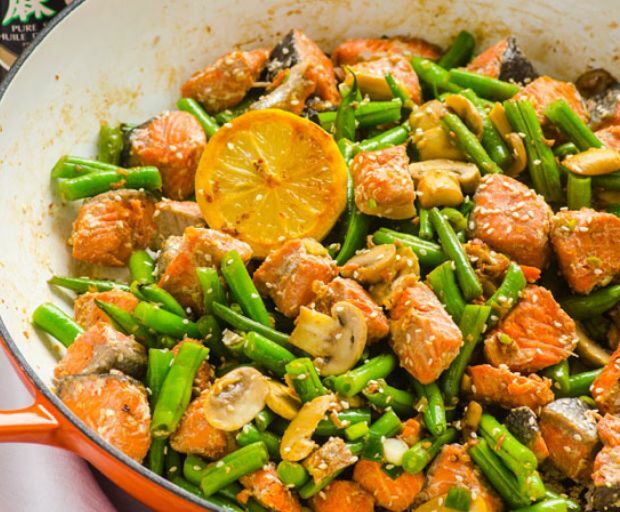 A quick stir fry is the best option since it’s made with wholesome vegetables, healthy salmon and takes just 10 minutes create. Heat the oil over a large wok, and fry the garlic until it begins to brown. Add the vegetables and cook for 2 minutes. Then add the salmon (feel free to cube or slice it into thin pieces so it can cook faster). Keep cooking for another 2 minutes until it begins to crisp. Combine the rice wine and soy sauce, and stir every few seconds. Cook for another 5 minutes, then serve immediately. Looking for a light dish for those balmy summer evenings? A mussel omelette is a quick and easy way to use those leftovers in the fridge and still keep healthy. This delicious meal is perfect for lunch or dinner and can also be served as an appetiser. Crack the eggs into a small bowl, beat them gently with a fork and season with salt and pepper. Heat the olive oil in the frying pan and cook the eggs over medium heat until they start to set. 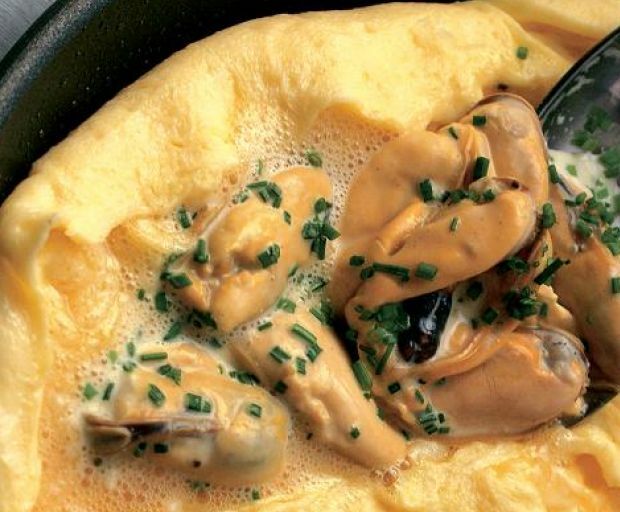 Transfer the omelette onto a plate, then sprinkle the cooked mussels, parsley and other vegetables over the top. Season again with cracked black pepper or chilli flakes. To celebrate the release of The Detox Kitchen Bible, author Lily Simpson has shared her cajun chicken with avocado salad recipe with SHESAID. Wheat, dairy and refined sugar free – as with all the 200 recipes in the book – this particular dish is all about the rich spices and aromatic flavour. Mix together all the spices, garlic and oil with a pinch of salt in a large bowl. Add the chicken breasts and turn them so they are covered with the marinade. Set a ridged griddle/grill pan on a medium heat and leave to heat up. Meanwhile, one at a time, place the breasts on one half of a large sheet of clingfilm. Fold the clingfilm over so that the spices are sealed in and gently bash the breasts with a rolling pin to flatten them to about 1cm thick. Remove the clingfilm, then place the breasts on the griddle pan and cook for 6 minutes on each side. Make the salad whilst the chicken is cooking. Finely chop the spinach, coriander, mint, parsley and red onion and mix together with the oil in a large bowl. Peel the avocados and remove the stone, then dice the flesh. Add to the bowl and fold in gently. Season with salt and pepper. For the salsa, combine all the ingredients in another bowl. Use your hands to mix, squeezing the tomatoes to create a chunky, juicy salsa. 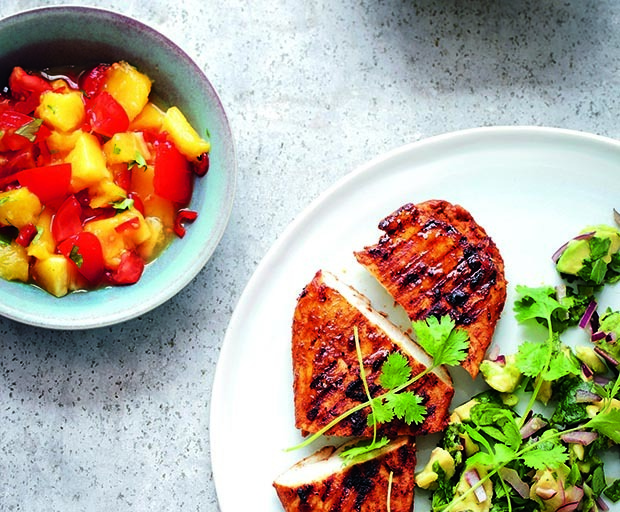 Serve each chicken breast with a big helping of the spinach salad and the mango salsa. The Detox Kitchen Bible is available at Dymocks. Who can resist a delicious serve of dumplings, especially when they’re filled with fresh vegetables and a chilli sauce – yum! Rather than heading out for dinner each time, make them from scratch at home. It’s actually easier than it sounds. Combine the flour, salt and baking powder into a small bowl. Add the water as you stir, then the oil. Keep mixing until the mixture has combined into a fine paste. Feel free to add any type of filling you like, or simply cook them without one. Use a spoon to scoop up each bit of the mixture, then drop it into a chicken or beef broth. Steam for 3-5 minutes or until the dumplings begin to rise to the top of the water. Looking for a healthy dinner recipe the entire family will enjoy? 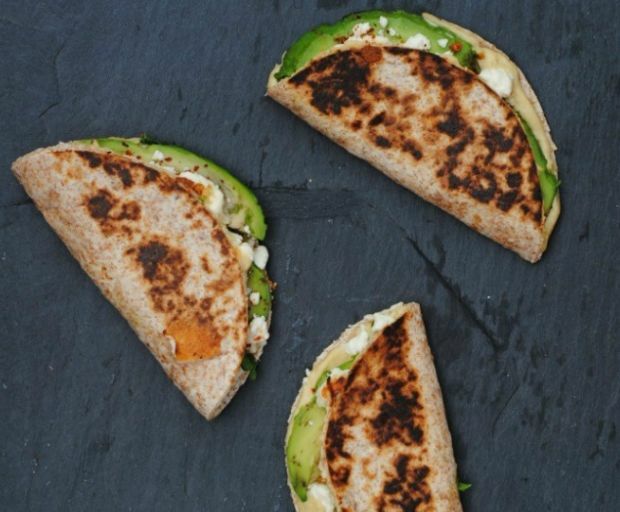 This yummy little creation brings together nutritious avocado, feta cheese, and hummus in a delightful little wrap – not to mention seasoned with red chilli flakes and cracked black pepper! Dice the jalapenos, and share give a generous serving on each wrap. Finish off with hummus over the top. Divide the avocado, sprinkle some feta cheese over the top, then add the pepper and chilli flakes. Fold each wrap over, then grill gently on each side until golden brown (you could also do this step before adding the filling). Who can resist a yummy spring roll? But we’re not talking about those already made at the store. 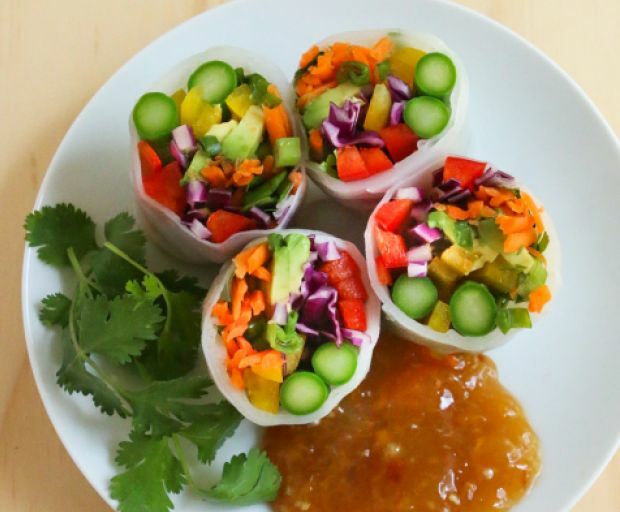 Why not take advantage of the seasonal fruits and vegetables to create a delicious rainbow spring roll, which looks good and tastes ever better! Slice the asparagus into small pieces, then bring it to a slight boil. Remove from the heat, and place to cool. You can also use broccoli as well. Slice the capsicum, carrots and red cabbage. Open up the spring roll wraps, then arrange them in the middle. Top off with avocado, then fold the bottom parts as well as the sides. You could leave it here for a healthy meal on-the-go, or make a quick red wine vinegar sauce on the side. 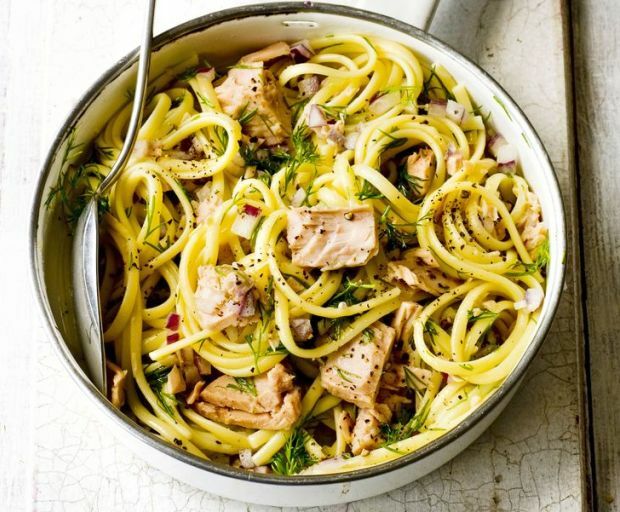 If it’s your turn to cook dinner tonight, try this delicious tuna linguine recipe. Packed with delicious tomato, cheese, and of course, an easy to prepare serving of protein for your day. Preheat the oven to 200ºC (400ºF) and line a tray with baking paper. Slice the cherry tomatoes in half, lay them on the tray, then drizzle with olive oil. Cook until golden brown with a crusty layer on top. Cook the pasta in boiling water, then drain and set aside. Crumble the tuna over each serving of linguine, then top off with cherry tomatoes, black cracked pepper, chilli flakes and finely chopped parsley. If you have a few leftover green vegetables, why not create this easy stir-fry which takes less than 15 minutes to prepare. Make the most of what’s in the fridge and throw a few of your favourite ingredients into the mix for a tasty dish that won’t leave you feeling hungry afterwards. Heat the olive oil in a large wok and add the finely chopped garlic, ginger and onion. Cook for about a minute until brown. Stir through the mushrooms and cabbage, then add the spring onions and broccoli. Cook for a few more minutes and then add the red wine and soy sauce. Serve immediately on its own, or boil some white rice or flat noodles on the side. Give your same-old salad a refresh by adding some healthy asparagus. Not only is this vegetable extremely easy to cook (especially for beginners), but it also tastes amazing with just about anything. Since we can’t deny a delicious egg for lunch or dinner, this recipe is perfect to whip-up if time isn’t on your side – it takes just 10 minutes! Wash and trim the ends of the asparagus, then cut the spears in half. Steam for 5 minutes so they still have some of their crunch. Leave them in for longer if you like them overcooked. 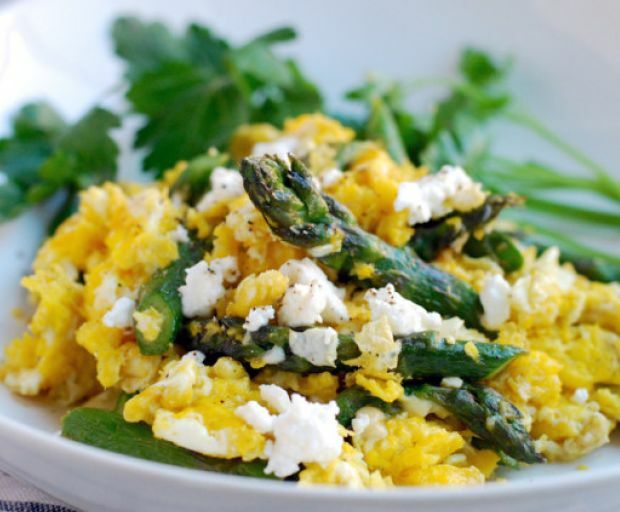 You can also poach your egg and serve it on top of the asparagus stems. Heat the olive oil in a large pan, then add the beaten eggs. Cook for 2 minutes, then add the asparagus. Remove the pan from the heat, and serve on a plate with chilli flakes (for an extra hit of flavour), fresh basil, and mint. 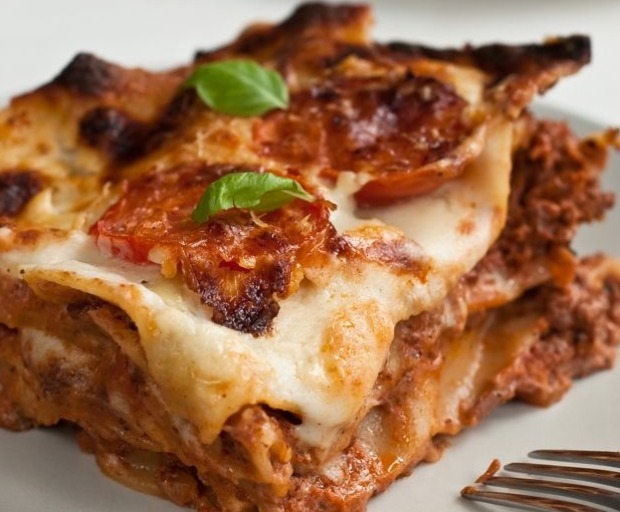 Combine both a classic lasagne dish with tasty bolognese for a filling cheat after a long day at work. If you have a little extra time on your hands, make your own pasta sauce using canned tomatoes, vegetable stock, and fresh herbs for a delicious meal which works well with a shiraz red wine. Heat a pan with olive oil and cook the mince until brown. Add the cooking sauce and stir occasionally. Season with salt, pepper, and herbs. In another pan add the butter until it begins to bubble up. Remove, then add milk and put it back on the heat. Keep cooking until the sauce begins to boil, then remove again and leave to cool. Cover the base of one tray with meat sauce and one layer lasagne sheets, then evenly distribute the meat sauce mixture. Keep this going for 2 more layers, then pour the béchamel sauce, and top off with the grated cheese of your choice. Set your oven to 180ºC (350ºF) and cook for 30-40 minutes or until the cheese begins to brown. 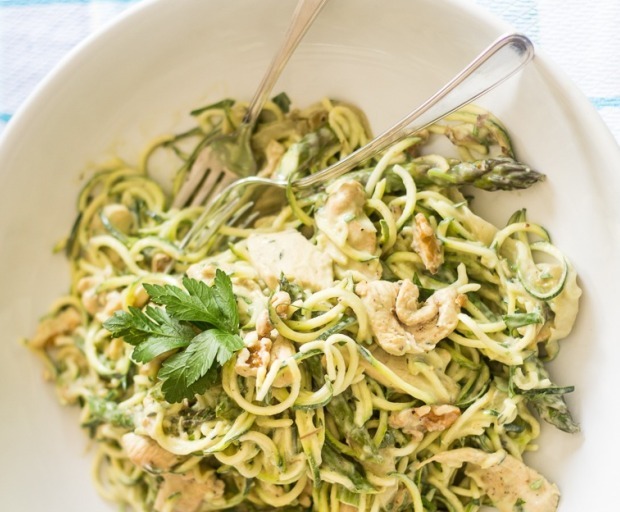 Treat the family to a healthy courgette dish which actually looks and tastes like real pasta, minus the added calories. 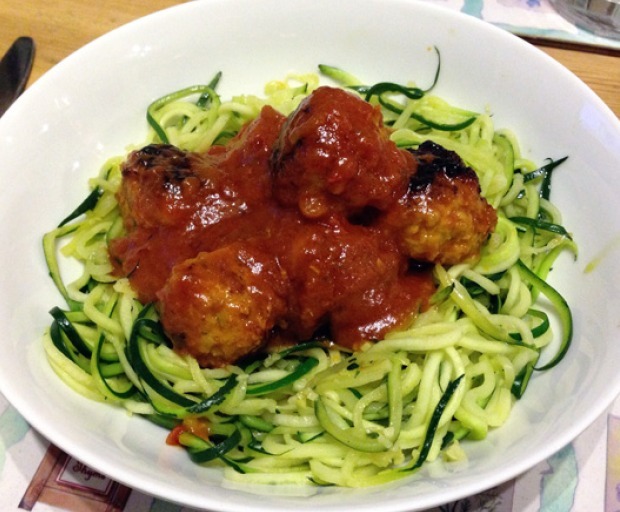 While this meal is made easy using a spiraliser to finely carve the courgettes, you can just slice them manually with a knife, add some tomato sauce and basil leaves to finish – yum! Wash, dry and chop off the ends of each courgette. Attach the courgette into the centre of your spiralser, then turn the handle. Make sure to place a bowl at the end to catch the spiralised courgette. Add one tablespoon of extra virgin olive oil over a hot pan, crush the garlic, empty out the can of tomatoes, and finally finish off with one tablespoon of vegetable stock. Stir well. Steam the courgettes for a few minutes until soft, drain them, then combine them with the tomato sauce. Mix well, and then transfer onto a bowl. Serve with a few basil leaves arranged over the top. If you don’t have time to make yourself a delicious dinner, try one of our quick wraps instead. They require less than 5 minutes of your evening, and taste amazing! 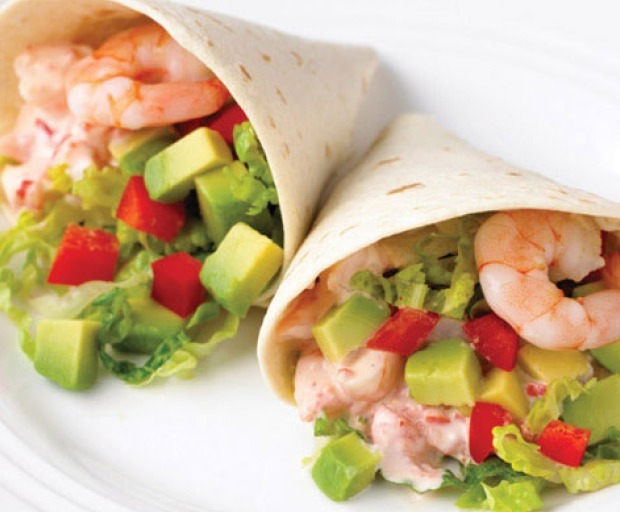 This week we’re featuring prawn and avocado (of course), with red capsicum and capers inside of a delicious wholemeal wrap. Lightly warm up the wraps over a pan, and set aside. Combine the prawn meat, capsicum, cucumber, tomato and avocado into a bowl. Transfer the mixture onto the centre of the wrap, then top with capers, baby spinach and rocket. Fold each wrap, and use a toothpick to keep them secure. Delicious latkes can be made with almost any kind of vegetable, but we’ve stuck with the classic potato dish for this recipe. Season with chives and Greek yoghurt to add some extra flavour on a cold, winters day. For an extra crunchy texture, use large russet potatoes which will taste too good to be true! Preheat the oven to 210ºC (410ºF), and line a tray with baking paper. Wash and peel each potato, then slice and grate into small pieces. Remove any excess moisture by wrapping in paper towels. Try to get the potatoes as dry as possible before baking them. Grate the onion, and combine this with the potato mixture. Combine the lightly beaten eggs, baking powder, salt, and flour with the potato and onion mixture. Arrange the mixture into small circles, and place onto the tray. Bake for 15-20 minutes or until the latkes are golden brown on each side. This is a much healthier alternative as opposed to frying with oil. A few greens on your pizza makes it healthier, right? This delicious pizza recipe features mouth-watering ricotta cheese on a bed of fresh dough, and infused with aromatic Italian herbs. The dough is really easy to make yourself; store it in a warm place for 2-3 hours before cooking for a light and fluffy base. Combine the sachet of yeast and warm water, stir lightly with a spoon. Wait for the entire mix to froth (this could take anywhere between 3-5 minutes). Create a well with the flour, then slowly add the water. Mix well with your hands, and add the salt and sugar. Coat with olive oil and transfer into another bowl with plastic wrap along the top. Store in a warm place and wait for the dough to rise. Toss the asparagus into olive oil and season with salt and pepper. Then, grill until tender and set aside on a plate to cool. Roll out the dough, and brush the surface with olive oil. Grill the pizza base for 3-5 minutes until golden brown. Brush the garlic and Italian herb seasoning over the base of the pizza, then add the Ricotta and half of the grilled asparagus. Put it back into the grill until the cheese has melted. Remove from the grill and add the remaining asparagus. 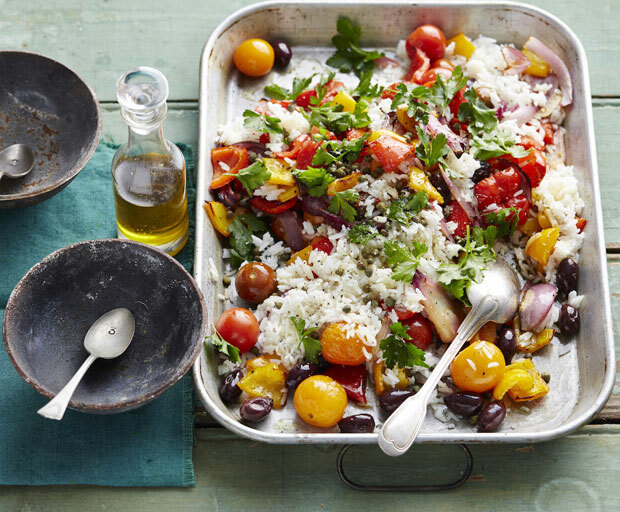 Serve with your favourite white wine, or alternatively a fresh rosé. 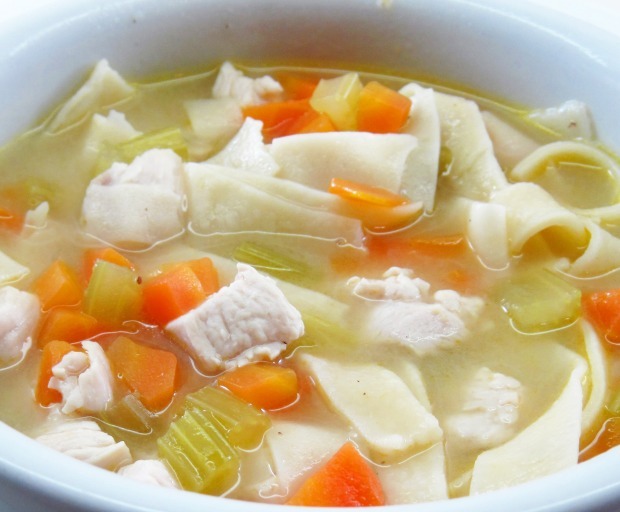 If you are feeling under the weather, or simply just want a pick-me-up from the cold weather, then chicken soup is the best meal. Our recipe taste just 15 minutes to prepare, and will become your go-to for the cold and flu season. Add a few of your favourite vegetables and soft noodles for some extra body if you’re feeling hungry. Fill a large pot with cold water then cook the chicken thighs over medium heat. Bring the water to a boil, making sure to skim all the excess at the top with a small spoon. Add all the vegetables, chicken stock cube, tomato, salt and pepper, and cover with the lid until it begins to boil again. Slightly turn down the heat then let it simmer for about an hour. Boil the pasta in a different pot, then add it into the chicken soup. Season again with salt and pepper. Not only is this classic Thai dish delicious as a takeaway, it’s also really simple to make at home. Our recipe uses crunchy green vegetables on a bed of wholewheat noodles, but you can use wholemeal rice, or soba noodles for a healthier alternative. The entire meal takes approximately 30-40 minutes to prepare, and serves 2. Bring a large pot of water to a boil, then add the broccoli pieces, baby corn, sliced carrots, and wholewheat noodles to the mixture. Cook until the noodles are tender, then drain the pot and transfer into a bowl. Next, heat the olive oil, minced ginger, and garlic into a deep-set frying pan, or alternatively a wok if you have one in your kitchen. Keep cooking until the mixture is golden brown, then promptly add the chicken and sesame oil. Cook for an additional 3-5 minutes or until the chicken has completed cooked-through. 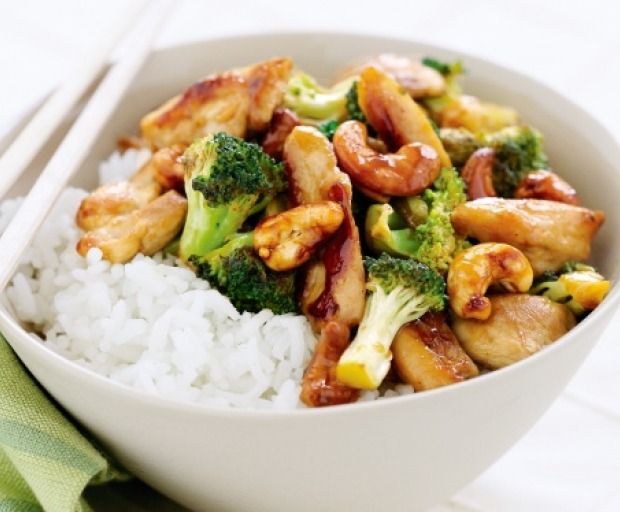 Stir in the noodles, cashews and remaining vegetables with a splash of soy sauce for an authentic taste. Make this delicious traditional Hungarian dish which is full of rich flavour and colour. Our recipe uses beef, but feel free to substitute it for veal, vegetables or even tofu for added taste or dietary requirements. 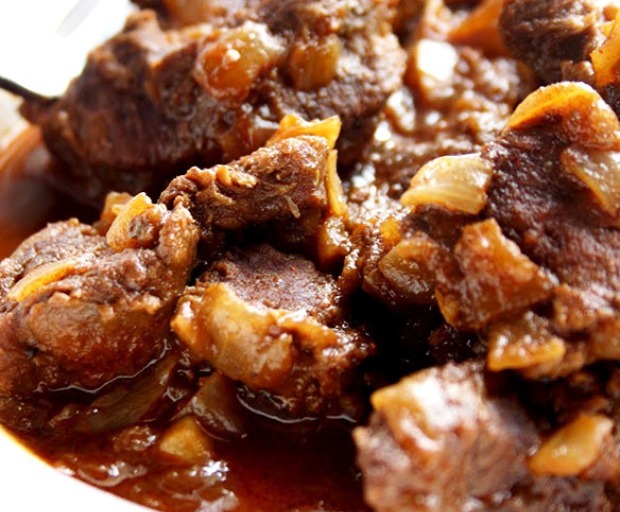 Serve with a side of deep-red wine which will bring out the flavour of the stew. Peel and chop the garlic and onions, then set them aside. Cut the beef into 4cm strips, and remove the nerves and fat with a sharp knife. Heat the oil, and sauté the onions until they are nearly brown. Combine the paprika, garlic, oregano, thyme, and cumin into small bowl. Pour three tablespoons of this mixture into the pan with the onions. Sauté lightly, then include the vinegar and 8-10 tablespoons of water. Finally add the meat, then include the salt and pepper before covering the pot. Add a few teaspoons of water to keep the goulash from drying out. Let this cook for 1-1.5 hours or until the meat is almost cooked. Combine the rest of the spices and pour some cold water over the mixture before covering it up. Let it simmer for 10-15 minutes, and serve immediately. Enjoy a delicious avocado pasta dish which is perfect if you want something light for the summer. Perfect for those on a gluten-free and paleolithic diet who love avocado a little bit too much, the recipe is easy enough to cook and serve for two. Turn the zucchinis into noodles using a spiraliser (it’s too difficult to cut them so finely yourself). Then set them aside in a large bowl. Cook the chicken over a pan on medium heat, and sprinkle with salt and pepper. Make sure it’s cooked through – this will take 5-10 minutes depending on your cooktop. Add the endive and asparagus, and cook until the vegetables are tender (another 5 minutes). Add the ingredients for the avocado sauce into a food processor, and mix until smooth and creamy. Now add the chicken and vegetables to the zucchini and mix well. The heat should cook the zucchinis just enough to become soft and tender. Sprinkle the fresh parsley and walnuts over the top before tossing and serving. 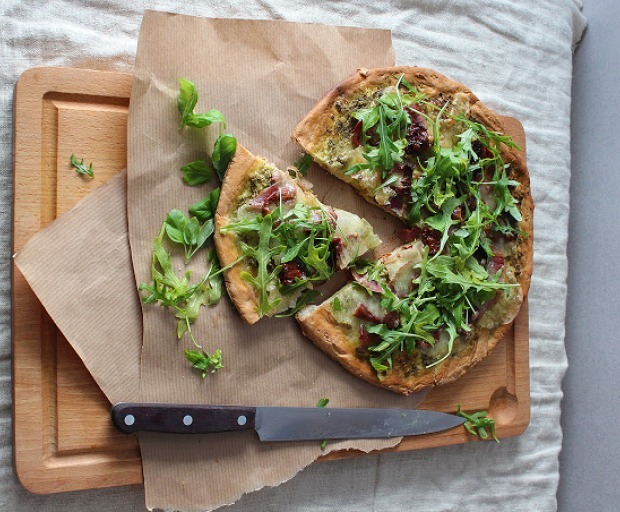 Create this guilt-free Friday night pizza recipe which is sure to be loved by the entire family. The dough is also made with one cup wholewheat flavour to keep things relatively healthy and light. Season with some fresh baby spinach and chopped avocado for extra flavour! Deposit the milk into a pan, and simmer for 5-10 minutes. Then add the yeast and sugar until the mixture has completely melted. Set aside for a few minutes, and let it cool down. In a large mixing bowl, combine the flour, egg yolk, and yeast mixture. Knead the dough until everything has properly combined. Brush with a touch of canola oil, and place back into a bowl. Cover with plastic wrap, and set aside so the dough can rise. This can take anywhere from 30 minutes to a few hours. Preheat your oven to 180ºC (320ºF), and line a tray with baking paper. Roll out the dough on a flat surface lightly dusted with flour. Then add the pesto sauce, tomatoes, prosciutto and mozzarella. Bake for 20-25 minutes or until the base is golden brown. Decorate with rocket and avocado slices. Create this delicious red curry and chicken dish with a healthy twist of quinoa instead of rice. Not only is this easy to make, but it’s so delicious (even better for lunch the next day!) 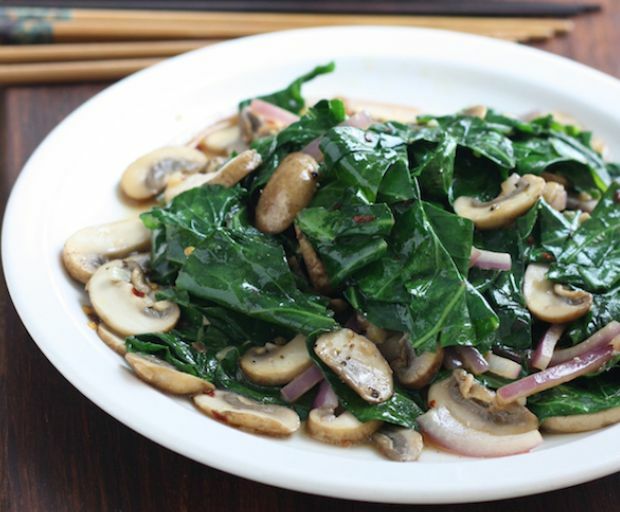 Add some of your favourite vegetables including capsicum, mushrooms, and basil leaves for fresh flavour. Heat some olive oil over a medium pan, and add the sliced mushrooms and sliced pepper. Cook on for 10 minutes or until the vegetables soften. Cook the chicken breast (doesn’t matter whether you choose to boil, grill, or roast it in the oven). Cut into small strips when it’s cooked. Add the coconut into a large pan to boil, the slowly reduce to a simmer. Then add the tablespoon of red curry paste, brown sugar, and lemon grass. Stir well. After 10 minutes, add the cooked vegetables and slices of chicken into the mixture. In another pan, boil 2 cups of water and 1 cup of quinoa. Cook for 10-15 minutes or until the water has been completely absorbed. 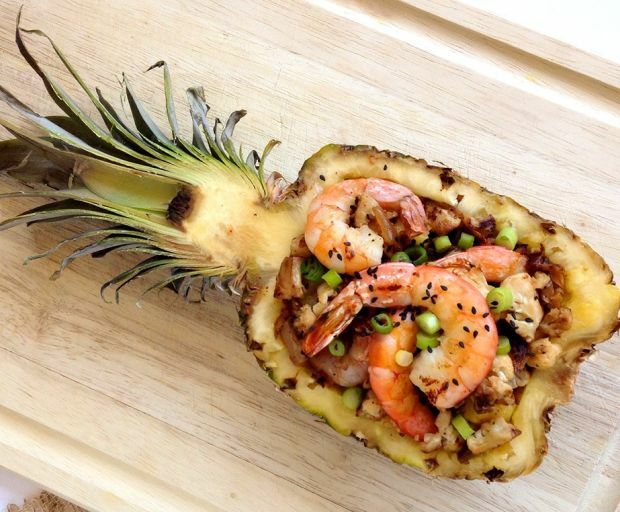 To serve, garnish with basil leaves, and serve with quinoa. Yum! Who doesn’t love to treat themselves to a deliciously sweet meal every now and then? This Eastern European delight is a modern twist to a classic pierogi (ravioli) recipe, which is fresh and ideal for warm summer nights. To make the dough, mix flour, salt, oil and water into a medium-sized bowl. Then simply cover the dough in a plastic wrap, and allow it to rise. For the sauce and filling, pour the cherries and juice through a sieve and into a saucepan. 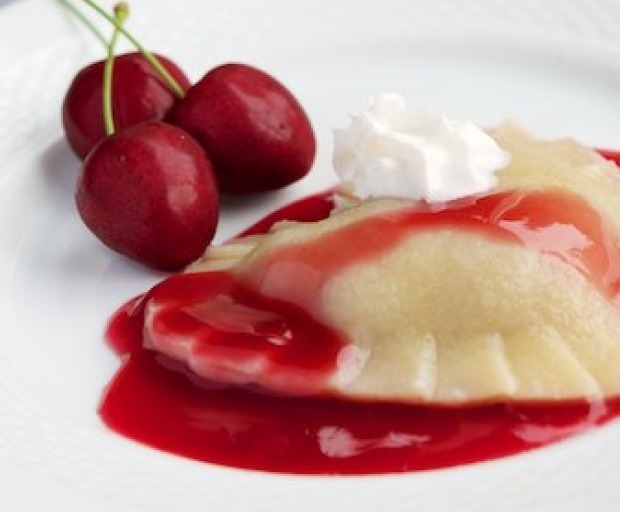 The strained cherries should have their own bowl, and set them aside to use as the pierogi filling. Add one tablespoon of sugar (or slightly more if you prefer a sweeter filling), then add the cornstarch, cinnamon, and juice into a pan and stir. Heat the cherry juice, and stir until it thickens. Remove from heat, and leave it aside to cool. Prepare the dough for the pierogi and kneed on a lightly floured surface. Remove a walnut-sized piece from the dough, then flatten with a rolling pin to create a small circle. Place 3-4 drained cherries in the centre of the dough, then press edges together with your fingers (or use a fork). 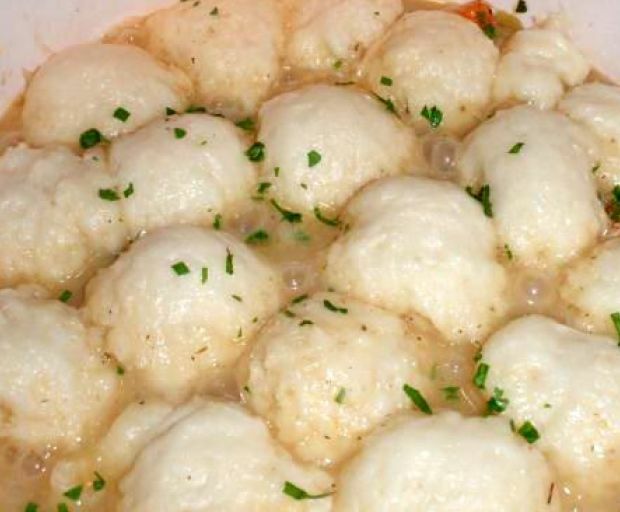 Bring a large pot of water to boil, then cook 4-5 pierogi at a time so they don’t overlap. Cook until they begin to float, then remove and let them cool down. Serve with mint leaves or a generous serving of your favourite whipped cream over the top. The perfect summer side – as tasty as it is filling! Preheat oven to 200°C. Put the rice and water in a medium saucepan. Bring to the boil. Reduce heat to low, cover and simmer for 12-15 minutes until small craters in surface of the rice. Remove from heat and stand covered for 10 minutes. Transfer to a large bowl, set aside to cool. Meanwhile, put the capsicum, onions and garlic onto a large baking tray. Drizzle with oil. Sprinkle with oregano. Season. Roast for 15 minutes until just tender. Add tomatoes, olives and vinegar. Roast for a further 10 minutes until just warmed through. Add the rice, capers and parsley to the warm vegetables. Season, toss to combine. Drizzle with extra virgin olive oil. Serve warm or at room temperature. Tip: Great served with barbecue prawns, chicken, lamb or beef.